The type of MRI lighting used in diagnostic environments can be a powerful therapeutic element, bringing comfort and genuine relief during scanning sessions. While natural daylight offers the best therapeutic benefits, in metropolitan hospitals where inward-facing planning is an unavoidable part of building design, a wide array of ambient, task, and accent artificial lighting is required. While the three major lighting functions are limited to illuminating the interior envelope, it's also possible to escape the limitations of the interior dimensions and reconnect patients and staff with a view of nature or open skies. Unlike daylight, which conveys environmental depth by virtue of its natural medium—the sky—isolated oncology areas exacerbate a patient's sense of vulnerability. However, designers can restore the spatial component of natural daylight by incorporating a remarkable optical illusion set within the environment of care. These illusions of nature have unique psycho physiological benefits. 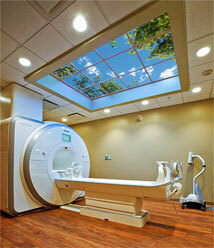 The standard use of nature art in MRI lighting relies on backlit panels featuring an assortment of outdoor scenes. These commercial images are used in a wide array of promotional media, ranging from printed literature and artwork to marketing banners and POS displays. Unfortunately, multi-purpose nature art imagery is not captured with the compositional cues necessary to establish environmental context. 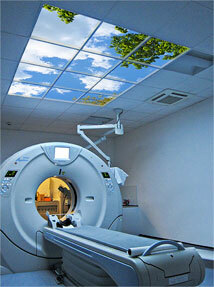 Sky Factory's approach to MRI lighting raises the bar. Rather than employ commercial photography, which relies on techniques that distort the field of view with a wide angle lens or other visual artifacts, our team of artists capture and frame our photographic compositions with the single minded intent of designing a powerful simulation of open sky and undisturbed nature. Unlike representational photography, Sky Factory's photographic compositions are part of a wider design framework called Open Skies Image Technology. This method employs proprietary nature imagery as the first element in creating genuine architectural illusions. Calibrated printing techniques working in tandem with modulated light intensity and color temperature yield distinct visual planes. The result is an impressive luminescence that allow modular compositions to achieve a three-dimensional effect on a two-dimensional plane ranging from standard drop ceilings to any finished ceiling treatment. Furthermore, when these image panels are combined with architectural reveals to enhance perspective, the installation appears to recede, forming part of a natural exterior that surrounds the interior envelope. This creates an illusory effect that triggers a deeper "Relaxation Response" in the casual observer that taps our innate Biophilia—our our hard-wired love of nature—and through it, enliven its most universal experience: a visual connection to open sky. 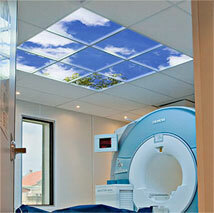 Sky Factory's illusions of nature are a unique, fourth type of radiology lighting that not only provide a therapeutic portal to open skies, but also use one of two LED lighting systems (edge-lit or backlit) to invigorate our circadian rhythm in isolated interiors. **Sky Factory's healthcare lighting is the only product of its kind with published, peer-reviewed studies on the positive clinical outcomes of its products on patients. 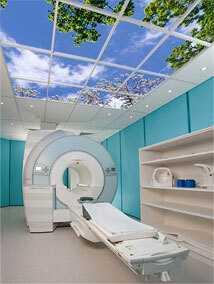 You can experience this type of MRI lighting by requesting a visit from our mobile gallery showroom, the Sky Mobile. See our schedule. 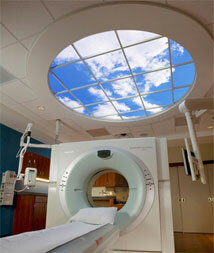 Sky Factory also showcases its suite of products at the largest and most established radiology, healthcare, and specialized trade shows in the U.S. and around the world. 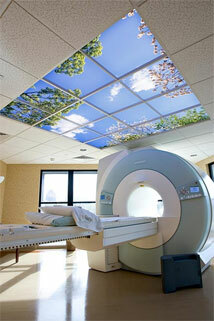 Our family of Luminous SkyCeilings and Luminous Virtual Windows, in addition to our Digital Cinema line are designed to enhance the patient experience in every area of a hospital, clinic, or care-giving facility. Our experienced Sky Designers look forward to work with you and give your workspace a therapeutic advantage from competitors that quickly translates into quantifiable benefits to the bottom line. 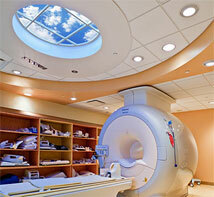 Promoting healing requires outstanding attention to environmental design. Take advantage of our research-verified virtual skylights—illusory views to nature that alleviate stress, reduce anxiety and mitigate pain medication usage. Because of our installations' superior realism and exquisite composition, as well as their unmatched luminescence and quality craftsmanship, Sky Factory Luminous SkyCeilings and Luminous Virtual Windows transform the look and feel of isolated interior spaces with effective illusions of sky and nature.